We have to say it, we love Singapore and we love the Esplanade. A wonderful hall, and an incredibly together and attentive staff and crew. Now we'd like to stop and enjoy the town, but we have to keep moving to yet another great Asian city, Taipei. Tonight's audience seemed to like our show. Toh Ban Sheng, the arrangerof Rasa Sayang, our Singaporean song - which by the way gave this program the distinction of having songs in both Malay and Maori- said that we had got it right, so that was a relief. There were a number of people present who had done the workshop this afternoon. 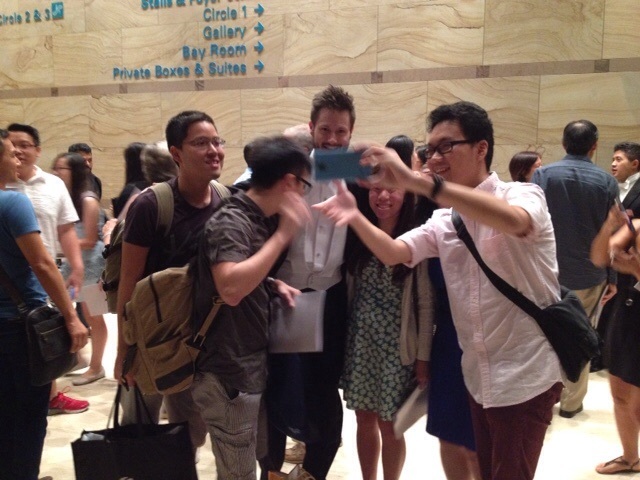 Unfortunately it's school exam time, so no students, but plenty of enthusiastic selfie takers afterwards.